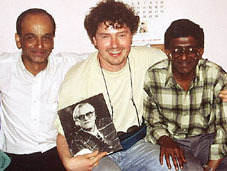 Peter van Ham with the two sons of Verrier Elwin, Ashok and Nakul, in Shillong. During his fieldwork trips Peter van Ham many times walked in the footsteps of early Western explorers who were the first and only ones before him to undertake research in remote regions such as Spiti or Arunachal Pradesh. Especially important for the exploration of Northeast India were Christoph von Fürer-Haimendorf and Verrier Elwin. 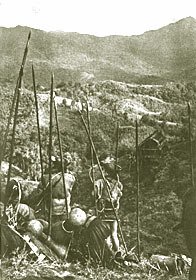 Fuerer-Haimendorf had explored the Konyak Nagas in the 30´s ("The Naked Nagas") and the Apa Tanis, Nishis and Adis in the 50´s ("Himalayan Barbary"). On his 1996 expedition to Arunachal Pradesh Peter van Ham met a man in Raga / Subansiri-District who had worked with him on his daring field trip to the Apa Tani Plateau in the 50´s. He remembered Professor von Haimendorf having been joined by his wife Betty and especially his habit of smoking "unbelievable masses of cigarettes...". When Christoph von Fürer-Haimendorf started his fieldwork in the Konyak country, the times of head-hunting had not been over. He took part in reprisal actions taken by the British administrators against the Kalyo Kengu Nagas in the unadministered and so far unexplored region near the Burmese border and was honoured as "The White Headhunter" by his Konyak friends. Later on Haimendorf worked among the Chenchus, a jungle folk of the Deccan and the Konda or Hill Reddis and other peoples of Orissa. He got into service for the Govt. of India as Special Officer on the North-East Frontier in 1944 and started his work on the Apa Tanis and their neighbours. Posted back to Adilabad he became Adviser for tribes and backward classes. In 1953 Fürer-Haimendorf was among the first to undertake anthropological research in the newly opened Nepal. He worked among the Sherpas and later also in Western Nepal. Till his retirement Christoph von Fuerer-Haimendorf held a seat as professor for anthropology at the University of London. Fuerer-Haimendorf and a Konyak girl in 1937. 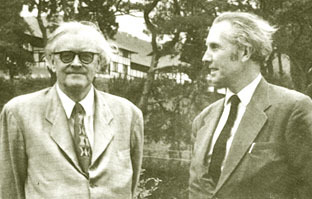 A highlight in the regard of "walking in the footsteps of early explorers" was when on their 1998 trip to Northeast India the couple came to know that the family of the great British anthropologist Verrier Elwin was still living in Shillong, once the administrative headquarters of the unified Assam and now capital of Meghalaya. Next to the works of Christoph von Fürer-Haimendorf, the books of Verrier Elwin - especially "The Art of the Northeast Frontier of India", "A Philosophy for NEFA" and "Nagaland" - had been the major inspiration and motivation for the author to venture to Northeast India in order to find out what had been left of the traditional culture described by the two great anthropologists. Called by Indians "One of the greatest Britishers ever to live in India", Verrier Elwin´s life story is a most remarkable one: He left his position as a clerical don at Oxford and travelled to India and became involved with a Christian group that was allied to Gandhi. He left the group and all organised religion in 1932 travelling through Central India opening schools and a leper home. His experiences there formed the basis for many of his books that drew from primitve religion, art, crime, poetry and myth for their subject matter. In 1941, Elwin married a member of the Gonds in a tribal ceremony and in 1954 renounced on his British passport to become an Indian citizen. From 1954 until his death in 1964, he was adviser for Tribal Affairs to the North-East India Frontier Agency (NEFA - now Arunachal Pradesh). Elwin became a sustained critic of imperial policy as manifested in both state and church. His critique of mission and government policies (both British and independent Indian) towards the tribes is full of insight. He died a few months after finishing his autobiography. "The Art of the Northeast Frontier of India"
Fürer-Haimendorf described Elwin: "No other anthropologist, neither British nor Indian, has made as massive a contribution to our knowledge on Indian tribal societies, and many of his books are sure of a place among classics of anthropological literature. He was one of the greatest romantics of anthropology and the most inspired chronicler of India´s tribal people." The acquaintance with the late Fuerer-Haimendorf has continued for Aglaja Stirn and Peter van Ham due to meeting Professor Alan Macfarlane, his wife Sarah Harrison and Mark Turin of the Department of Social Anthropology at Cambridge University, England and working with them on various projects. Alan was the last student of Haimendorf and administers the original films he furnished while being in NE-India in the 50's and late 60's. Parts of these films are being digitized as part of the "Digital Himalaya Project" to be saved from decay and to be returned to the people of NE-India. For more information about this amazing undertaking please click on the link towards the left. Or go directly to Professor Macfarlane's homepage!